The Telegraph: "In the following piece, Dvorák's violin concerto, the limelight was seized by a very different kind of musicianship, as imperiously virtuoso and blazingly energised as Zinman was relaxed. It came from violinist Julia Fischer, who has the kind of flawless technique and steely vibrato that seems impervious to human fallibility." The Guardian: "Fischer, meanwhile, has very much made the Dvorák concerto her own of late, and played it here with great warmth of tone and lyrical fervor." Evening Standard: "There were rustic pleasures in Dvorak’s Violin Concerto, where the wistful Bohemian mood was captured to perfection. 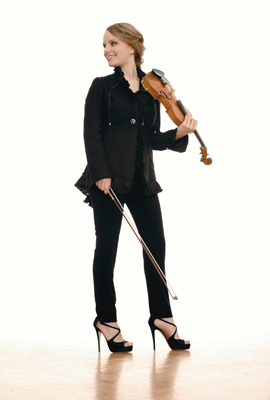 Julia Fischer was the accomplished and eloquent soloist." Boston Globe: "Bell served up this sun-drenched work, a violin concerto in all but name, with playing of suave technique and unstinting flamboyance." Berkshire Eagle: "And Bell’s suave, silken-toned performance of Lalo’s "Symphonie espagnole" delivered audience-thrilling virtuosity in the insinuating Spanish rhythms and tunes, yet never lost sight of the underlying musical thread." The Plain Dealer: "Overpowered at times by the orchestra under Tovey, the artist needed only to project and emote somewhat more boldly. In all other respects, Gomyo was a champion. A sweeter, more lyrical sound would have been hard to imagine, and to the music's technical demands, the violinist brought a level of dexterity almost beyond belief." The Classical Review: "Without doing anything particularly idiosyncratic, Midori delivered a wholly satisfying performance, tackling this ineradicable warhorse with characteristic verve, fire, and tonal gleam." The Buffalo News: "When Kamio and Hadelich became the focal points for the remaining pieces, it became apparent that these guys were well worth booking." Birmingham Post: "Tasmin Little was the soloist in Moeran’s Violin Concerto, and her sound, as ever, was a thing of wonder: her poise, her shamelessly luscious vibrato and the iridescent sheen of her tone making you imagine how Heifetz might have played this beautiful, under-rated work." Reichel Recommends: "The youngster is already a well rounded, one might say seasoned, musician. Her artistry and stage presence show a level of maturity well beyond her years." Japan Times:" A Japanese university student has won first place in the violin category at an international Bach competition, the first Japanese to do so in the contest’s 64-year history, organizers said." The Day: "In a statement Hahn's agency said, 'Following medical advice, Hilary Hahn very much regrets that she must withdraw from her professional engagements for the next six weeks due to an inflamed muscle. Hilary is looking forward to resuming her concert schedule in September.’” Wishing you a speedy and full recovery, Hilary! Did you attend a concert in the past week? If so, please tell us about it in the comments. And if not, why not? Please support live music in your community by attending a concert or recital whenever you can!